During the period late December to July “Mistress” is based at Surfers Paradise on Australia’s Gold Coast. There are two fisheries available from this location. The Blue Marlin fishery off the Gold Coast was only “discovered” in the mid 1980`s. Prior to that Anglers were catching Juvenile Black Marlin (Little Blacks), and Sailfish in prolific numbers just offshore and never ventured “wide”. At the edge of the Continental Shelf (ie the 100 fathom line) 20 miles offshore there is now proven to be good numbers of Blue Marlin averaging 300lb to 500lb. There are bigger fish present and an 836lb fish has been weighed, and at least two fish reliably called at well over 1000lbs has been lost. Over 10 years fishing these grounds “Mistress” averages one fish released per day which is quite a high average by comparison with most Blue Marlin fisheries; i.e. Bermuda, Bahamas, Hawaii. Mistress is renowned as the east coast’s most successful Blue Marlin boat, releasing more blues than any other boat over the last 10 years. Our best day was one in which we Tagged 11 Blue Marlin.10 to one Angler—, and we stopped fishing at 3.30pm. Imagine what we may have caught had we stayed out till dark. Nevertheless “Mistress“ still set the new Australian one boat, and one angler, one day records which we had previously set with 6, but which had been equaled. We generally fish lures in this fishery, as this has proven the most productive method, and use either 80lb, or 130lb which gives us a decent chance at landing a truly big Blue. The biggest Blue Marlin caught off the Gold Coast is an impressive 836lb but fish reliably called at over 1000lbs have been lost. The nature of the fishery is such that we are day tripping as there is nowhere to stay out on the fishing grounds. However Live aboards are possible in the sheltered Broadwater (Equivalent of the Intercoastal) each night and travel out to the grounds again the following morning. 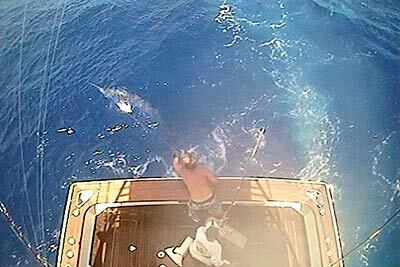 We have the ability to move with the Blue Marlin travelling to other ports on extended live aboard charters. We fish with either 80 or 130 lb at the charterers request although 130lb is recommended in case Big Julie appears. 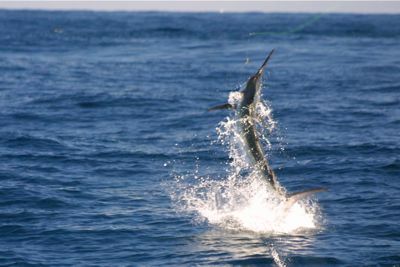 Every year usually beginning in December Little Black Marlin which are around one year old migrate south down Australia`s East Coast following schools of bait. They usually average 35/50lb in December, but grow so quickly that by March they are more likely to average 50/100lb, some years we get a run of 2yr old fish which average around the 100/200lb mark. By the end of March they are normally gone. When Little Black Marlin are here they aggregate on Bait Schools in depths of between 15 and 50 fathoms very close to shore. Thus multiple catches in a day become the norm rather than the exception, and we have experienced seasons in which we have averaged 6 fish tagged per day of fishing. It is a fascinating experience to be catching Marlin in the shadow of high-rise buildings sometimes in water so shallow you can see the bottom. It is quite exciting because we catch them using 12/16lb line using standup gear, and the little fella`s typically jump all over the ocean quite close to the boat; so good photo and video opportunities. Also excellent fun and experience for youngsters who may feel intimidated by heavy tackle chair fishing. Little Black Marlin can be caught on lures, live baits, or dead baits. Sometimes one method works better than others but they are all productive. The Gold Coast is Australia`s holiday playground. Sun, surf, pristine beaches, high-rises, theme parks, and a Casino. It’s a miniature version of Waikiki, Honolulu, South Beach, Miami, and Disneyland, rolled into one. The theme parks are MovieWorld, SeaWorld, DreamWorld and WhiteWaterWorld. There are a number of 5 Star Hotels, and dozens of high rise buildings offering self-contained apartments (condominiums? )The Gold Coast offers entertainment for all the family and is an exceptional fishing location.